Ponca City’s Board of Commissioners will consider and vote on an ordinance imposing a 0.833 percent excise tax (sales and use tax) to be used to fund public safety capital expenditures for Ponca City at Monday night’s meeting in City Hall. The tax would be in addition to all present city, county and state excise taxes for all taxable sales under state law. This new tax would be specifically to build a new Police and Public Safety department to replace the current police department, which was built in 1975.
the Public Safety Center. The current facility houses the Police Department, Jail, Emergency Management, E-911 Communications, and Municipal Court. Once the space needs assessment was completed, it was determined that there was a need for a much larger facility. ADG then began the process of developing a conceptual design for a new Public Safety Center. At that time, the City also determined that the Court Operations would stay in its current location and a Judicial Center would be created, separating the Court Operations from the Prosecution Operations. 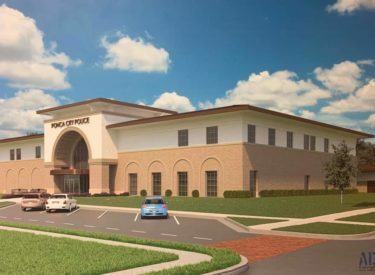 ADG has designed a 46,000 square foot facility to house the Police Department, along with jil functions, E-911 Communications, and Emergency Management. This footprint allows for future growth of operations as the needs arise in the future. The estimated cost of the facility including soft costs is $20 million. The current sales tax rate for Ponca City is 8.667 percent which includes a 0.500 percent (1/2) cent sales tax for the Ponca City RecPlex, expiring September 2020. The City would like to place before the voters a 0.833% tax, which in essence is continuing the 0.500 percent (1/2) cent sales tax and an additional 0.333 percent, to bring the total sales tax rate in Ponca City to 9.0 percent. The 0.500 percent sales tax would then expire Sept. 30, 2028, allowing the debt to be retired in 8 years instead of 13. The proposal will also provide that the 0.333 percent would continue into perpetuity for Public Safety Capital for both Police and Fire. This 0.333 percent will not be available until the Public Safety Center debt is paid. If this proposal is approved by the commission, the board then would consider and take action on a resolution authorizing the calling and holding of a special election on Tuesday, June 11, 2019, for Ponca City voters to approve or reject the 0.833 percent excise tax resolution, with the tax becoming effective Oct. 1, 2020 and the half-cent portion ending Sept. 30, 2028.